These sweet, oaty bars are a healthy alternative to shop-bought cereal bars and provide the perfect energy boost when you're in a hurry. 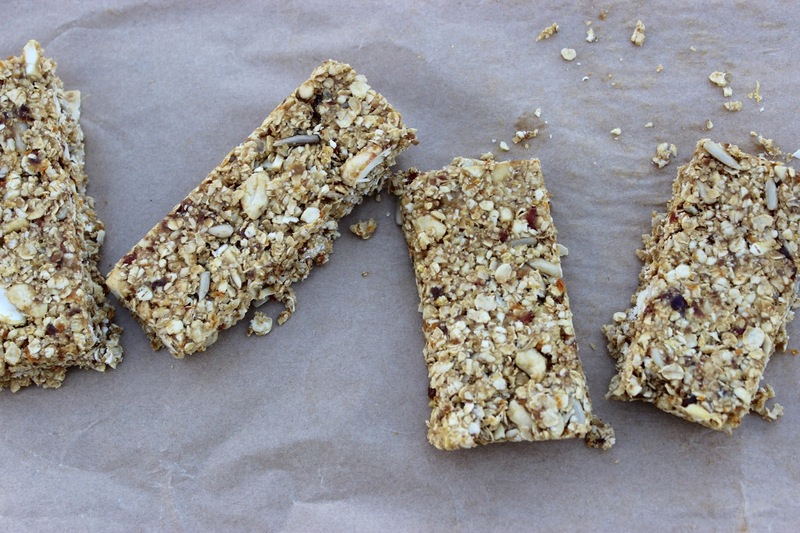 I've named these "breakfast bars" simply because they are an on-the-go twist on my Cashew and Orange Granola recipe (if you liked that, you'll love these!) and both my boyfriend and I have been reaching for them in the mornings a lot lately but they can, of course, be enjoyed at any time of day. 1) Line a 10.5 x 8 inch rectangular brownie or cake tin with greaseproof paper. 2) Place the cashews in a food processor and pulse a few times to coarsely chop. Tip into a mixing bowl and add the oats, sunflower seeds, orange zest, ginger and salt, stirring to combine. 3) Next, whizz the dates in the food processor, gradually adding the orange juice followed by the cashew butter. Whizz until it forms a sticky mixture. 4) Add the sticky date mixture to the mixing bowl, along with the coconut oil and date nectar, if using. Stir thoroughly to combine. 5) Press the mixture into the prepared cake tin and refrigerate for a few hours or preferably overnight to set. Cut into bars.